By now you probably know that many people who want to maintain healthy joint function and mobility need to make sure they consume proper and natural nutrition. Many have found Forever Freedom by Forever Living Products (FLP) a practical and nutritious way to defend against the signs of aging, joint wear and other soft tissue problems. Many research studies by Forever Living has produced one of the most remarkable products in the marketplace today called Forever Freedom. 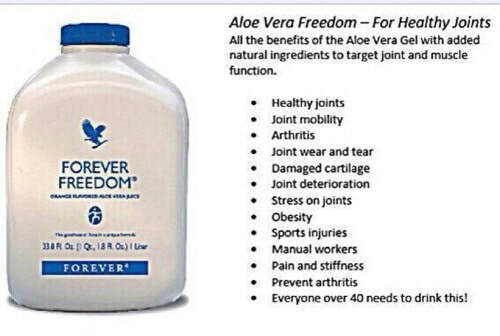 A product that combines the legendary properties of Aloe Vera used for so many years with some of the best known ingredients and supplements to help maintain healthy connective tissue and joint function that include: Glucosamine sulphate, Chondroitin sulphate, and MSM. Forever Living is the first company to combine all of these ingredients into one easy-to-use, pleasant-tasting, orange-flavored drink, and for good measure we have also included extra Vitamin C. All in one drink. What is Forever Freedom? Forever Freedom is an orange flavored drink formulated by Forever Living Products for aiding in the maintenance of proper joint function and generally better health. What are the ingredients of Forever Freedom? Stabilized Aloe Vera Gel (Juice), Sorbitol, Natural Orange Juice Concentrate (Flavor), Fructose, Glucosamine Sulfate, Chondroitin Sulfate, Natural Orange Flavor, Methyl Sulfonyl Methane, Ascorbic Acid (Antioxidant), Citric Acid, Potassium Sorbate (To Help Protect Flavor), Sodium Benzoate (To Help Protect Flavor), Tocopherol (Antioxidant). Contains Shellfish (Shrimp, Crab, Lobster). How much should I drink a day? Because our body uses these natural components (Glucosamine, Chondroitin and MSM) on daily basis, we recommend you drink Forever Freedom every day as per your own feel. Consumption may vary based on body size, age and type of condition you currently might be experiencing. Can I overdose on Glucosamine, Chondroitin and MSM? No. Because all three elements occur naturally in the body, your body uses what is needed and flushes any excess out. How and Where do I or purchase Forever Freedom?